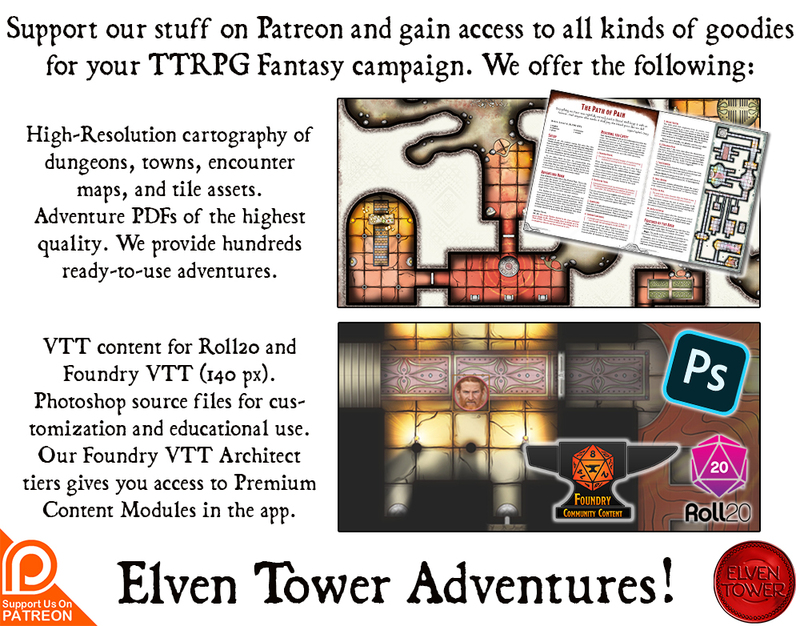 Good day Prospect Denizens of the Tower, what follows is an explanation of what’s included if you decide to join my Patreon page. The illustration you see here is FREE for personal use though. I bring you the first Roll20 ready map of July. By the way, Happy 4th of July ! (provided you’re American). This illustration comes in many configurations. The barrels, boxes and boat are actually separate assets. I have provided some “premade” pics. But if you want you can add move or rearrange them. The files for the individual assets are found on my Patreon. The Cove illustrations are .jpg and the individual things like the barrels are .png files. The cove illustration is measured to be compatible with Roll20. 140px per square and 72 dpi resolution. They are however usable in any other VTT, printable or usable any way you want. There’s also black and white printer friendly version available if you want to not give a bad day to your printer. I did not read you swearing before; what if your mother or grandmother sees that. I like that you keep the language clean; there are so many in the frpg and osr that have no fear of God for their filthy language, but most are Yanks or Brits and that’s expected. I think that you, along with your incredible talent and dilligently work ethic, should bring some decorum as well to the industry. Good luck with your ENNIE; I will be voting for you! You’re right I always keep the language civil. I guess it was a “slip” due to a bad day. It’s been duly edited. And thanks for your nice comments. I’m really looking forward to what the Ennies this year will bring to the RPG community in general. Yours has certainly been a great success story; And I am sure that you inspire many others! To be motivated to follow and have faith in your talents is something very special. And thank you for caring about my comment; most folks would tell me where to go and what to do there, but I had a good feeling that you are a well raised and decent young man, and so took a rare chance. I hope that this year brings more blessings and success for you and yours, brother. I must say I owe everything that has been coming my way to followers and supporters. I would never disregard a comment or go so far as insulting a person. It is thanks to you and other people who read my content or use my art that I’ve gotten where I am now. Thanks for your good wishes. Blessing to you too, my friend.